Posted by Mark Ness on December 1, 2017. Now that we’re a few months into 2015, it’s a good time to follow up on those New Year’s resolutions you made before the ball dropped and you went back to business as usual. Maybe your resolutions were personal in nature such as exercise more or stop smoking. If you had aspirations to improve your business or work life, it’s so important to apply tactics that can be scheduled and measured in order to stay in track, especially if there have been changes in your industry or the economy which could derail your vision and possibly your motivation. One such method for improving your life was presented at the most recent Profiles International World Conference where Tim Wackel introduced his 30-20-10 Rule. With over 25 years of successful sales leadership, Tim applies specific client research to deliver workshops that are motivating and informative. Tim introduced the habit of investing 30 minutes each day to exercise, 20 minutes to reading and 10 minutes to writing. These disciplines can be completed any time of day, whenever you’re most productive. It’s important to be true to yourself when creating and maintaining New Year’s resolutions in order to better your chance for success. Using the 30-20-10 method of combining physical exercise with intellectual stimulation, professionals (especially those in sales) will find improvement in their personal and work life. Self-awareness is an important attribute to consider when creating resolutions. We introduced in our article How to Execute with ANY Audience that self-awareness means being aware of ones traits, feelings and behaviors AND the IMPACT those factors have on our audience. Using the 30-20-10 rule to improve yourself is noble but to take it a step further and improve your interactions and your effect on others will help you be your personal and professional best. When executing an assessment, especially in a team setting, we consult with each employee on how they might be perceived and offer suggestions on their leader’s perspective, based on the results. This helps to broaden their perception of team interactions to create a more engaging, harmonious work environment. Next, we’d like to explore how to use the 30-20-10 Rule and the concept of self-awareness, to meet or exceed some sample resolutions. You’ve tasked yourself with 30 minutes of exercise, 20 minutes of reading and 10 minutes of writing each day so now, how can that be applied to being a more successful sales person? The 10 minutes of writing should be a journal to help you put your day’s experience on paper in order to clear your mind before the sales meeting. Tim Wackel suggests that it’s important to ask questions. Good, insightful, discovery questions. Maybe you need to read about the company or the person that you’re selling to or read Tim’s book “Anatomy of a Lousy Pitch” to get motivated. Then, take 30 minutes before or after the meeting to take a walk and reflect on your performance. These tactics will help you become more aware of how you’re being perceived by the prospect. The definition that I like to use for charisma is being more concerned about how you’re making others feel about themselves than how they feel about you. This doesn’t mean that you’re “wowing” or impressing them. If, as a leader, you’re making your employees feel good about themselves, this can dramatically increase engagement, productivity, profitability, and even the success of their careers. All making you a more successful leader! It does, however, mean that you have to be aware of how you’re affecting others. Start by reading our case study, Leadership Charisma where Bud Haney and Jim Sirbasku (with Deiric McCann) explain the “Know me. Show me. Move me” concept. 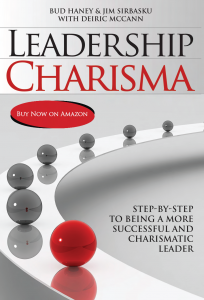 Then, take 10 minutes to write down ways to apply this book to your own leadership style. Finally, by exercising 30 minutes each day, you’re showing your employees that taking care of your health is so important and it gives them “permission” to take 30 minutes out of their day as well. Not sure about the effectiveness of your management style and the impact it’s having on others around you? We offer a free, one hour training demonstration for leaders to experience the assessment and, more importantly, the execution process. Also at the Profiles International World Conference, keynote speaker John Jenson taught us that presence is everything. His speech on “Your Professional Best” set the stage for learning the 30-20-10 rule. Using these methods that help you become more self-aware, New Year’s resolutions will be easy to maintain and achieve AND will have a positive effect on those around you.